Q. Do I have to take my vehicle to an insurance recommended repairer? A. 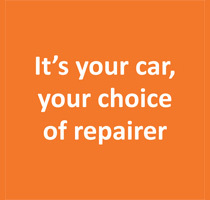 No – It’s your car, your choice of repairer, irrespective of who your insurer recommends. It’s becoming increasingly aware that certain insurance companies are advising their clients who have been unfortunate enough to have been involved in an accident that they have to take their vehicle to one of their ‘approved repairers’. This is not actually true – Legally you can have your vehicle repaired at a garage of your own choice. Often customers are steered towards the insurance companies’ approved repairers for the insurers’ convenience, not necessarily the customers. We are a leading independent insurance approved repairer and have over 40 years experience giving you peace of mind and a high quality finish on your car repairs. Once you have appointed us as your repairer and have given us your insurance details, we will take it from there and arrange the details of the repair. So if you are unfortunate enough to require bodywork repairs and wish us to carry out that work, then insist it comes to us! A. Most modern vehicles will come with a dash display advising you when your service is due. If your vehicle does not have this function then generally an annual service is recommended. If you’re still not sure, then call us for advice where we will be happy to help. Q. Is my warranty affected if I use an independent repairer such as yourselves? A. No – In October 2003 a European Union legislation affecting the motor trade came into force. Its full title is Block Exemption Regulations 1400/2002, in short ‘BER’. It means that motorists have more freedom in their decision as to who should look after and maintain their cars. As long as the garage of your choice uses original parts or parts of a matched quality, your vehicle’s warranty will remain valid and unaffected. Q. Can I drive a car on a motorcycle licence? A. Yes – If it’s a B1 motorcycle licence you can drive a quadricycle. We are a main dealer for Aixam and Microcar quadricycles so call us to arrange a viewing and test drive.